Another Poky Pedaling Potluck Picnic is coming up this Tuesday. It is always a great opportunity to enjoy a nice bicycle ride to a scenic park where you can dine on a variety of food contributions from Poky Pedalers. The Poky Pedaling Potluck Picnic will meet Tuesday July 14 at 5:15 PM in Goerke Park near the entrance to the public swimming pool. From there, we’ll slowly ride between 3-5 miles on calm streets and non-motorized paths to a mystery park location that is different each time. Poky Pedalers will carry their picnic contributions on their bicycles – other Poky Pedalers always have extra room in case you need assistance transporting your goodies. 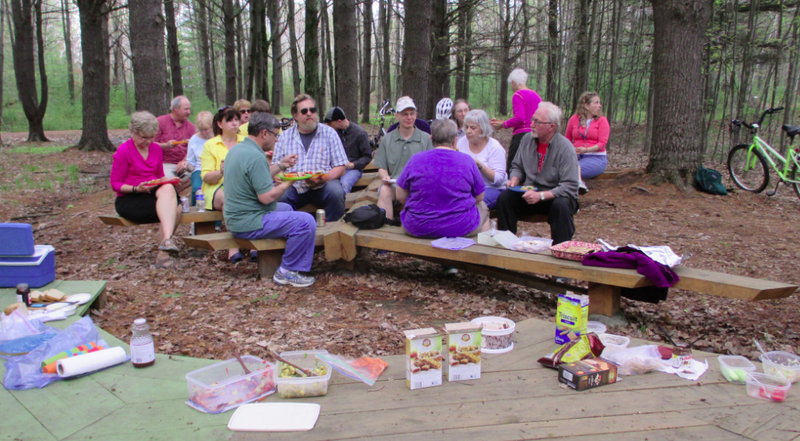 When we arrive at the park, we’ll create a massive spread and share a wonderful picnic. The PPPP is free of charge, there is no need to sign up, and all Poky Pedalers are welcome. Each Poky Pedaler should bring a food or drink contribution (no alcohol please). Some create a homemade salad or main dish or dessert, while others purchase a bag of chips or a jar of pickles or other store-bought items. All food and drink contributions are equally appreciated. Experience shows that we always enjoy a splendid feast. As usual, I will prepare a huge supply of vegan potato salad, known as Poky Pedaling Potluck Picnic Palate Pleasin’ Potatoes. For those curious about the recipe, you can find it here. I will also bring plates, utensils, and cups for our group, although Poky Pedalers are encouraged to bring their own. Once our picnic is complete, we’ll pack everything up and I’ll ride back to Goerke Park with those who prefer to return to our starting location. If you want more ideas about food to bring, or if you are looking for more info on how the PPPP works, you can read this webpage. More general info about Poky Pedals and whether they are family friendly can be found here. As of Sunday evening, the weather forecast for our Bike Fun is iffy due to a chance of rain. Temperatures should be in the mid-to-upper 70’s with some clouds. The chance of rain all day Tuesday is between 40-50% until around the time of our picnic, when that rain probability diminishes. It looks like only light rain is supposed to fall, although the chance of a thunderstorm is also a coin flip. If it seems appropriate, I’ll select a mystery park location that provides dry ground and shelter from any rain that might develop during our picnic. I will post weather-oriented updates to this blog post and on Twitter on Monday and several times on Tuesday, so I recommend checking back to learn the latest. If it seems that waiting out the rain is a good option, I might even delay the start time by 30 minutes. Let’s just hope that the forecasters are completely wrong about the rain and that we’ll have a nice evening for our PPPP. I look forward to sharing Bike Fun with all Poky Pedalers this Tuesday.